To access the 2019 AAHL Championship photos, it can be view at www.alaskasfocus.com --> "Find/Reorder Your Photos" (5th tab down) --> "Events" (4th tab) --> "2019 AAHL Championships". Beginning with the 2013-2014 Season, all players (AAHL and SHL) will be required to up Date their Player Card. Cost for the cards will be $10. Replacement cards cost will be $25 for the first replacement and successive replacements will be $50 each. 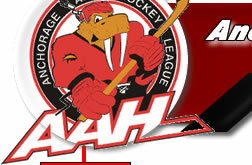 All players must be a minimum of 18 years old to participate in the AAHL. Novice West will be required to wear a full face mask. If you receive a game misconduct or a match penalty, and your card has been taken by a referee, you will have to sit the required game(s) from the team that the penalty was received. This applies to the AAHL League. Any player not wearing a half shield properly attached in the down position will not be able to participate in game play. Goalies do not have to be on the team roster to play, but they do need to have an ID card. turn in a copy of your receipt to the League office. First Session Rosters will freeze October 1st. No new Players will be added after this date. Second Session Rosters will continue to have a freeze date of February 1st. Ben Boeke will provide two referees for each game. However, due to the large number of teams, refs are not always available. Games will not be rescheduled due to lack of refs. Players must get their cards from Alaska's Focus Photography, 209 King Circle, Anchorage. All adult players in the Anchorage Area will be required to have an picture ID Card to participate in any game. Players will need to hand these cards in to the ref/scorekeeper at the beginning of each game. Cards will be returned after the game is done. If a player receives a game misconduct or match penalty, his card will not be returned until their penalty has been served. The cost of the card will be $10.00. It will not be need to be updated every year. A schedule of dates, times and locations for players to get ID cards made will be in your registration packet and posted on our the web site. Players will not be allowed on the ice if they do not have an ID card or are not on the roster. This process is being recommended by the Refs Association and the State of Alaska Hockey Association. It will help to ensure game misconducts are served by players and players on the ice are on the roster. and goalie list for new team members!